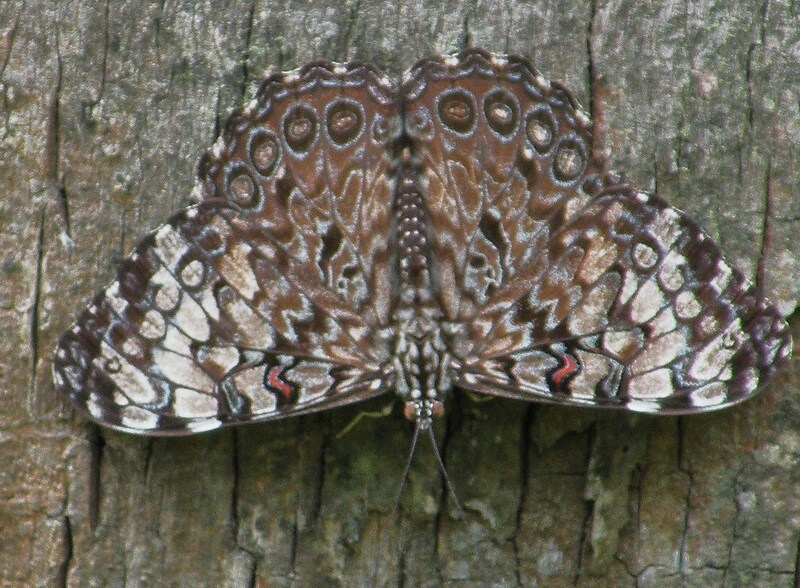 Identification: Upper surface is patterned with brown, gray, and tan; outer half of forewing is lighter and there is a red bar in the cell. 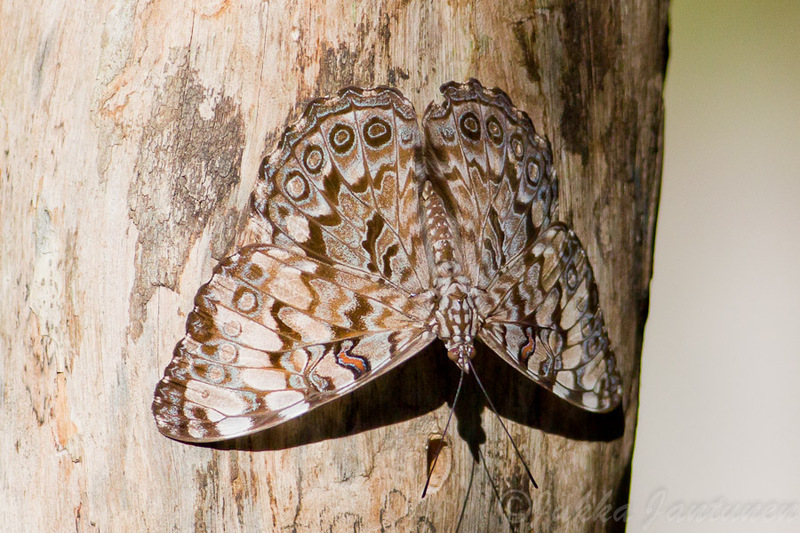 Upper hindwing has eyespots with a mottled brown and white center circled in blue, then a wide black ring, and outside of that, another blue ring. 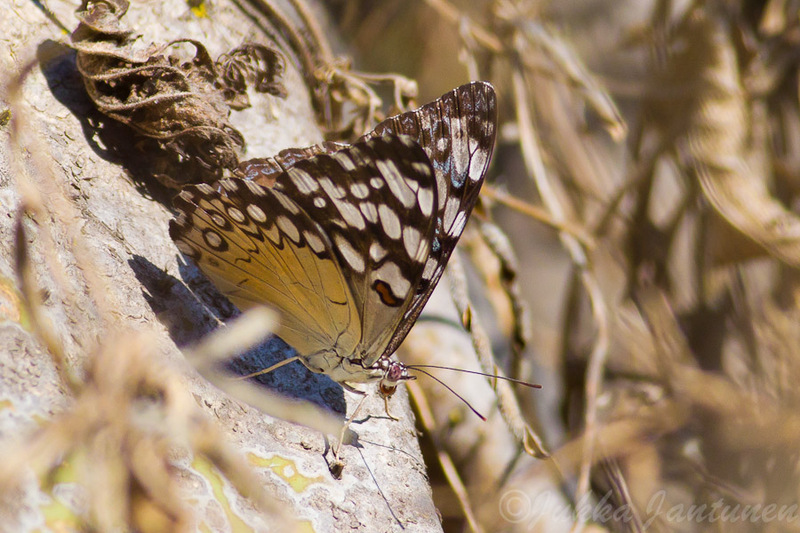 Underside is tan and white; forewing with a large white spot below apex, hindwing with submarginal black rings. Wing Span: 3 - 3 7/8 inches (7.6 - 9.8 cm). Life History: Eggs are laid singly underneath mature leaves of the host plant. Adults perch on tree trunks head downward with their wings spread open; males await females and make a cracking noise when they dart out at other insects. 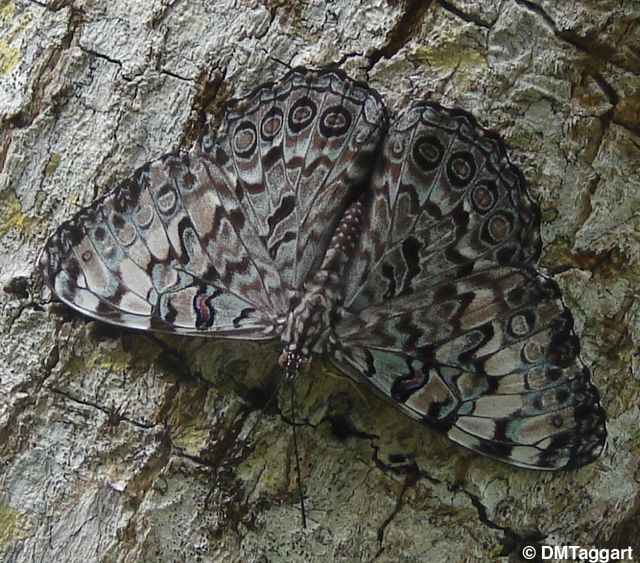 Before dark, adults gather on a single tree, then disperse to roost in nearby trees or shrubs. Flight: All year long in the tropics; August in South Texas. Caterpillar Hosts: Vine Dalechampia in the spurge family (Euphorbiaceae). Adult Food: Sap, dung, and rotting fruit. Habitat: Tropical forest edges, stream valleys, and cutover areas. Range: Costa Rica north through Central America to Mexico. A rare stray to the lower Rio Grande Valley of South Texas. Conservation: Not required for a rare tropical stray.